Home / Donald Wellington / Gyamfi's Column / Karela United / Sports / Player Focus - Donald Wellington, the Leone touch! Player Focus - Donald Wellington, the Leone touch! Ashantigold SC were the losing finalists of the 1997 CAF Champions League after winning the Ghana Premier League three times running. The 1993/4 season begun that surge by the miners.Then Togolese first choice goalkeeper, Nimombe Weke and striker, Kossi Noutsoudje were prominent features for the miners. In 1999, Asante Kotoko could barely raise a team to play in the premier league when the club was handed over to Mr. Herbert Mensah to steer. Instantly, he got players in which forward Clovis Kambou, a Burkinabe national, and Frank Atsou, a Togolese defender, were part. The duo later departed but woukd be remembered for their efforts to the Royal Red Army. 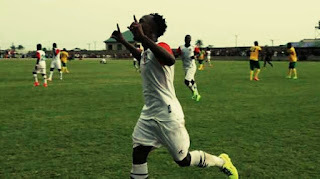 Cameroonian, Valentine Atem in the early 2000s was a gem at Obuasi and quite recently Burkinabe national goal tender, Soulama Abdoulaye (RIP) are all internationals to have graced our league with their quality. What of Hearts' ex-captain, Robin Gnagne? The mercurial Amed Toure? Great additions to their clubs and our league's history. On player focus today, Gyamfi's Column takes a look at Sierra Leonean striker Donald Wellington's first strides for league debutants Karela United. Affectionately known as "Kobo Kobo" to the Sierra Leonean and Aiyinase football fans alike, the 25 year old forward joined the "pride and passion" side in January 2018. He had last played for East End Lions in Sierra Leone. 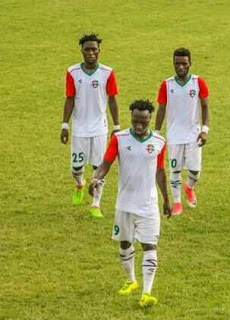 The forward who has represented Sierra Leone from under 17 to the under 23 levels was given a chance to impress the Karela technical team in the off season games. Well, he did miss a penalty in the G8 Pre season tourney but his energy and added competencies were so glaring. With 4 caps for the Leone Stars (home based) and an international stint with Superettan side, IFK Varnamo, he joined the westerners as a big name addition. He became the second foreigner to join the league debutants after Jean Vitale Ourega. To kick start his two year contract, he got a goal and an assist each as Karela beat Dwarfs at their invincible CAM Park. He couldn't be denied the Man of the Match award. He followed it up with another Man of the Match performance at the Dawu Park as Karela played away to Dreams FC on matchday 5. The game ended scoreless but his performance earned him a personal score, the award. “I am happy so much for this move because we are not playing football for now in my country,” Wellington. In the next 7 league games he suffered a goal drought but Coach Johnson Smith kept his faith in him because he loves to work his socks off and has the ability to create scoring openings for other players. He managed 4 assists to his name in this spell. Big names are bought for big occasions and Donald delivered once again. It was the 13th fixture and against the defending league champions, Aduana Stars, he bagged a brace to give side the maximum points at stake. His second goal came on the 93rd minute to send the CAM Park on a frenzy that ran deep into the night. With 3 goals and 5 assists to his name, the forward has been involved in 53% of the debutants league goals so far. His desire to get onto the ball, his aerial superiority and his eye for the final pass makes him the last piece to the Karela puzzle.